The Starfire and the Drifter, in the usual stopping point at King's Bromley. 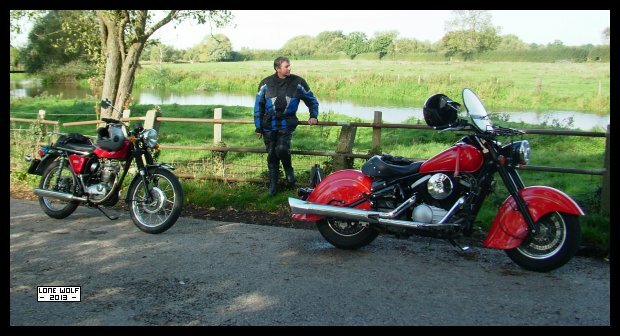 Monday saw me getting surgery on my right knee - so I now have two "bad legs"
Ian and Andy came down - Andy rode the Bantam back. I should have been going home with Ian but I ended up staying another night. Tuesday and Ian came all the way to Stoke Mandeville again - this time I actually made it home. Had to have a Sanam celebratory curry later on though. As you can imagine, I didn't really go anywhere this week, but I did get the hand change finished on the MZ. Saturday and I took the BRUB down to Hampton Loade for the SVR diesel gala event - didn't stay long due to the pain in my legs. A video of some nice Deltic diesel two strokes can be seen HERE. Sunday and it was the BRUB that went out and about. I'd best not use anything with a kickstart until this right knee is a bit more capable. We did the best part of 150 miles around the Peak District, stopping for coffee and cake at Wetton Mill, then sausage, chips and curry at Matlock Bath. A video will be available HERE once I've edited and uploaded it. . . . .which I've now done.